This factsheet is for people who are considering having surgery to remove a ganglion. Ganglions are swellings that stick out from the lining of a joint or tendon. 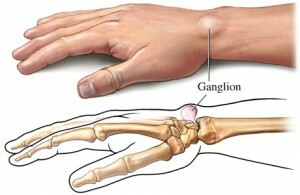 The main symptom of a ganglion cyst is a swelling in the area affected. They tend to be smooth and round and can vary in size. Some can be large and prominent, while others are so small that you can’t feel or see them. Sometimes they shrink or grow, and may even disappear altogether, only to reappear at a later date. If a ganglion cyst puts pressure on a nerve, you may experience discomfort or altered movement. It’s not usually known what causes the fluid to leak out of your joint or tendon, leading to the development of a ganglion cyst. However, women are more likely to get ganglion cysts than men, and you are most likely to get them in your 20s to 40s. Sometimes, ganglion cysts form after an injury or after placing too much stress on a joint or tendon (for example, following repeated stress on the wrist in gymnasts). However, most people have not had an injury and the cause is unknown. Our doctor can usually make a diagnosis just by feeling and looking at the lump, and asking questions about your symptoms. He or she might shine a small bright light through the lump, as this can help to confirm that the fluid inside is clear. If necessary, our doctor may ask to draw some fluid out of the lump into a needle. He or she will send the fluid to a laboratory for analysis to confirm that the lump is a ganglion. Sometimes, our doctor may suggest referral for an X-ray or other test, such as an ultrasound or MRI, to rule out other conditions or to check for small ganglion cysts that aren’t visible. Ganglion cysts are harmless and aren’t cancerous. Many disappear on their own without any treatment, and often they don’t cause any trouble. Because of this, most people don’t need any specific treatment. Instead, our doctor will just keep an eye on your cyst and wait to see if it disappears on its own over time. If your ganglion cyst is painful or is affecting how you move your hand (or foot), you can have it drained to reduce the swelling. This is called aspiration. A needle is used to puncture the cyst, and the fluid is drained away. Aspiration is done under local anaesthesia, so the skin over the area will be numb but you will stay awake. Aspiration reduces the swelling, but it’s likely that your ganglion cyst will come back later. If you want to have your ganglion cyst removed and aspiration doesn’t help, our doctor may recommend surgery to remove it. Surgery to remove a ganglion involves cutting the skin over where your ganglion is, and removing the ganglion from the joint or tendon lining. Afterwards, the cut will be closed with stitches and covered with a dressing. Most ganglions are removed under local or regional anaesthesia as a day-case procedure. This means that the treatment area will be completely numb but you will stay awake. Local anaesthesia numbs the small area that is being operated on, while regional anaesthesia numbs the whole limb. You may be offered general anaesthesia for larger ganglions on the wrist or ankle. This means you will be asleep during the operation. Your surgeon will advise which type of anaesthesia is most suitable for you. If the ganglion has been removed from your hand or wrist, your nurse may put your arm in a sling. He or she may also give you a splint or cast to support your arm or leg. Before you go home your nurse will give you some advice about caring for your healing wounds and a date for a follow-up appointment. The area will feel sore, stiff and swollen for a few days after surgery. Complete recovery can take two to six weeks.